The Chinese New Year (CNY for short) is celebrated all over the world. Based on the lunar calendar, this year the auspicious date falls on January 31. Overseas Chinese communities celebrate CNY in various ways and several are represented in the Greater Toronto Area. There are however a few ritual common denominators among these groups. The first thing which might catch your eye is all the red and gold. Chinese households and businesses post as many red and gold paper decorations up around CNY as possible and each of these has a specific meaning. The essential notions embodied in them include the desirability of such universals as prosperity, luck and happiness throughout the New Year. You might see also intensely coloured depictions of the horse, 2014’s animal of the year. Now to the main course of this column: music and other related forms of entertainment. These too have a place in CNY festivities. The lion dance, internationally emblematic of public Chinese festive events with its idiosyncratic loud musical accompaniment designed to animate public space, is a must-have CNY fixture with an ancient pedigree. Stirring both in sound and in the animated movements of the “lion/dragon,” its performance is meant to bring good fortune as patrons and audiences usher in the New Year. It is accompanied by drumming, cymbals and hopefully the bracing, awakening and auspicious sounds of a shawm. Martial arts and qigong demonstrations channelling good energy, as well as Chinese astrology auguring (hopefully) much more of the same also have a place in public events marking the CNY. Downtown Chinatown may be the best venue to partake of the fun, after of course putting up some glittering decorations, giving or receiving red envelopes, pocketing the cash and enjoying a sumptuous feast. February 1 the Toronto Chinatown Business Improvement Association presents a free public festival launching at noon at the Chinatown Centre, 222 Spadina Ave. and continuing until 5pm. The action then begins up the street at the aptly named Dragon City Mall, 280 Spadina Ave. at 1pm. The lion dance performers will be there as will martial artists, Chinese theatrical dancers and selections from the several regional Chinese operatic styles. In addition the Toronto Zoo will show off their prized panda, one of China’s most celebrated and internationally recognised icons. The Chinatown BIA evidently wants you to tarry at the festival, enticing visitors with a Wishing Tree, demonstrations of qigong and booths offering numerous fun CNY-themed all-ages activities. I need as much good luck this year as possible so I’ll likely visit the “dart playing to bring good luck” booth. In case you need an extra day to digest your Chinese feast the same two venues present the full program at both locations from noon until 5pm the next day, Sunday, February 2. At the Library: Musically Celebrating Black History Month: As I have noted in my columns in previous years February marks Black History Month. This year the Toronto Public Library is celebrating BHM by hosting an ambitious program of well over a dozen separate free music-centric workshops and concerts by mostly local musicians in branches all over the city. Most of the events are kid-friendly and are scheduled for 45 to 60 minutes, so my advice is to arrive a little early. For full details and locations please visit the TPL’s informative website, but I’ll highlight a few here to give a flavour of the programming. The series kicks off Saturday, February 1 at 2pm with “Drumming with Amma Ofori” at the York Woods branch. Ofori and her troop of young percussionists will in TPL’s words, “rock the library with traditional African beats.” February 3 at 7pm audiences can join in “Hands-on Drumming with African Drums for Youth” at Don Mills branch’s auditorium. The Mystic Drumz youth workshop will feature demonstrations on African instruments including djembe (the very popular hourglass-shaped hand drum of West African origin), “talking drums” (smaller drums with adjustable pitch that can imitate vocal inflections), agogo (bells played with a stick) and other percussion. After the demonstrations, why not stay to learn to play one of the instruments and then perform an entire piece together? Space is limited, so best call the branch to register. February 12 at 1:30pm the Humberwood branch hosts “Caribbean Folk Songs & Calypso.” Roger Gibbs will through music and stories trace the “Caribbean folk roots of calypso and how the music spread to the world.” February 15 at 2pm the award-winning kalimba (a.k.a. “thumb piano”) virtuoso, bandleader and storyteller Njacko Backo animates the Maria A. Shchuka branch. Njacko Backo performs the music, dances and stories of Cameroon, his West African homeland. February 25 at 2pm the Tsingory Dance Company performs the dances and music of the island nation of Madagascar at the North York Central Library auditorium. Tsingory Dance leads the audience on the tour of the island, “showcasing the changes in Madagascar’s varying cultures and traditions.” Saturday, March 1 at 2pm, also at the North York Central Library auditorium, Frederic Sibomana performs stories and music of Rwanda and region. Titled “Contes et musique d’Afrique/Stories and Music of Africa,” Sibomana’s concert brings to a close TPL’s Black History Month celebrations. Musideum continues its intimate eclectic concert series on February 4 with “Lehera II: Anita Katakkar and George Koller” with a recital centred on the lehera, a concept in North Indian music in which a melody in a particular raga outlines the framework of the tala (time cycle here articulated by the tabla). In “Rakkatak,” her latest fusion project, Toronto tabla player Katakkar layers tabla rhythms with instrumental melodies and electronic soundscapes. 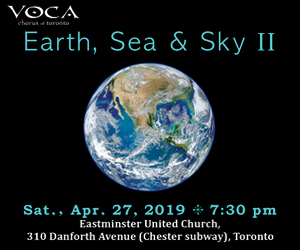 The lehera itself is played by the veteran Toronto bassist and multi-instrumentalist Koller on the dilruba, a Hindustani multi-string bowed instrument of which he is perhaps the foremost Canadian exponent. On February 21 at the Sony Centre for the Performing Arts the Soweto Gospel Choir offers its own tribute to Black History Month. Celebrating its tenth anniversary with an international tour and a new CD, Divine Decade, the award-winning, 52-voice South African Soweto Gospel Choir is renowned for its passionate gospel sound. The choir is also noted for its choral fundraising efforts in support of HIV/AIDS orphans, a cause in which it had an ally in the late Nelson Mandela. Andrew Timar is a Toronto musician and music writer. He can be contacted at worldmusic@thewholenote.com.